Raspberry Ketones have become extremely popular since being talked about on the popular Doctor Oz TV show. This Raspberry Ketones supplement is used for burning fat, and I am going to give you a little background on the product and let you know if it is a good supplement to take for burning fat. I just ordered my first bottle of Raspberry Ketones that came in the mail last week, and I can already notice a bit of fat loss happening in my stomach area (my only problem area right now). Update #1 – My dieting got interrupted by a visit to Las Vegas this weekend, but I’ve continued to notice the Raspberry Ketones are helping with my fat loss. I’m going to continue at the gym and with the Keytones and will update in another week or so. On Doctor Oz they introduced Raspberry Ketones and its benefits for fat loss, but didn’t really go into much details about the supplement. I wanted to know more about the supplement so I did some more research and found out just how useful they can be for helping with weight loss. Raspberry Ketones are a compound that is actually found in red raspberries. On the Doctor Oz show I learned that although they come from red raspberries you would need to eat about 90 pounds of raspberries in order to get a sufficient amount of Raspberry Ketones. Raspberries are a great super-food to eat because of the ingredients, but eating too much will give you too much sugar and will interfere with your fat loss. Taking a Raspberry Ketone supplement is a perfect solution. How does Raspberry Ketone help with fat loss? Apparently the Ketones break down fat cells in the body. With the fat cells broken down it becomes more easy to burn that fat. Dr Oz demonstrated this with putting balloons into liquid nitrogen. When the balloons went into the box of liquid nitrogen they shrivelled up – demonstrating what fat cells do when the Raspberry Ketones are present in the body. The Ketones also contain a supplement that is said to be similar to “synephrine”. Synephrine is supposed to help increase metabolic rate and support energy enhancement. After doing a lot of research about Raspberry Ketones I didn’t find many more details on how exactly it works to burn fat, but I guess by breaking down the fat cells that is how the fat loss occurs. I am not a doctor so I can’t answer that question. From everything I’ve read it looks like if you follow the directions on the Raspberry Ketone supplement packages regarding doses you should be fine. After all the supplement comes from red raspberries. You shouldn’t see any side effects, but if you do contact your doctor immediately. How much do Raspberry Ketones cost? 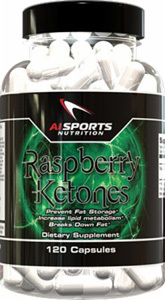 A bottle of Raspberry Ketones cost around $12-30 depending on the size and the quality. Look for a reputable supplement company to ensure you are getting the best quality of ingredients. The bottle I purchased (to the right) cost roughly $30, but you are getting 120 capsules. I would recommend buying your Raspberry Ketones online at BodyBuilding.com and they will last for 2-3 months. You will also notice that Raspberry Ketones are an ingredient in a lot of higher priced fat burners. These fat burners combine a variety of different fat loss ingredients to make one powerful fat loss supplement. If you are looking for something a little more powerful than Raspberry Ketones I would try something like Ripped Freak that has the Keytones in the formula. I will update this page after I finish my full bottle of the supplement and let you know if I see any very positive results. I am just a week or so into my bottle and I can already see a bit of a difference, but I haven’t been on them long enough to do a full review. Bookmark my workout tips site and check back! I look forward to your review! I am about to start mine. I bought the drops that go under my tongue for better absorption. It says take them two times a day…but doesn’t say whether they can be taken in the morning and then at night or not. I worry about taking them to late and not being able to sleep. thoughts? Brandy I would take them in the morning and mid afternoon. I don’t think taking them at night would be a big deal, but the earlier the better most likely. Really interested in how your progress is going.. Thinking of buying the raspberry ketones but wanted some feedback before I started them. Maryann, I will let you know now that this isn’t some miracle fat loss supplement that will make you see instant results. But with that said, the price is VERY reasonable and along side a “clean” diet of healthy foods it will speed up your fat loss – I’ve already seen some good results! I don’t want to look like a genetic freak and be doped up on “Ripped Freak”. I just want to lose weight . It is not as healthy as raspberry ketones. Basically, it’s just the latest over the counter dope that should be regulated.